This is the first home I remember well. I lived there throughout elementary school. I loved this home in Tyler, Texas. 1524 Milam Drive. I have some of the best memories there. My mother had flowers planted around the mailbox. Back then, curtains lined our windows, not blinds. Our best friend lived at the end of the street—Redessa. 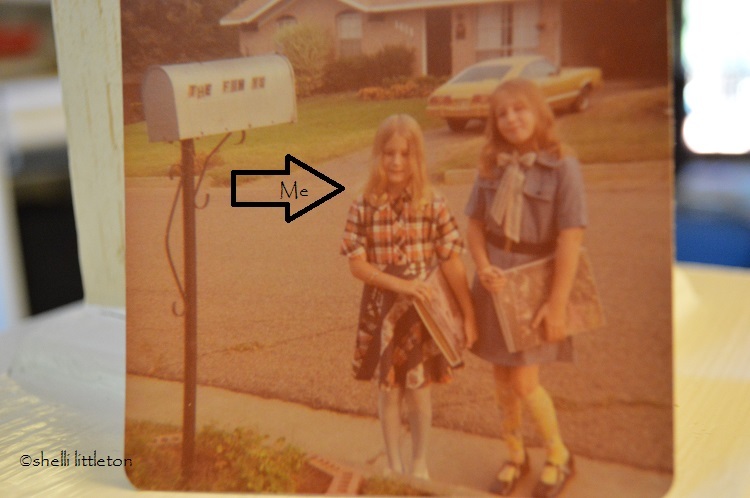 I remember sitting in her boat in the garage and us three girls (my sister included) singing “Rock the Boat” … and her parents put on the best Halloween party, even great to a chicken like me. I practiced line dancing to “Le Freak” here because we were learning it and dancing to it for exercise in school. We had dune buggies that we rode down that street, and those were eventually replaced by our bikes. A gas station sat behind our house, and we’d walk, sometimes sneak, there to buy candy. Our neighbor to the left had emphysema, and we loved him. We had honeysuckle growing on our back yard fence. But do you see that big picture window, to the left of the front door? That was our family room and that’s where I stood and cried when my daddy left our family. I watched him leave, and I’ll never forget that moment. I cried, “Daddy, Daddy … I love you.” Everything changed in that moment, my life spun out of control. 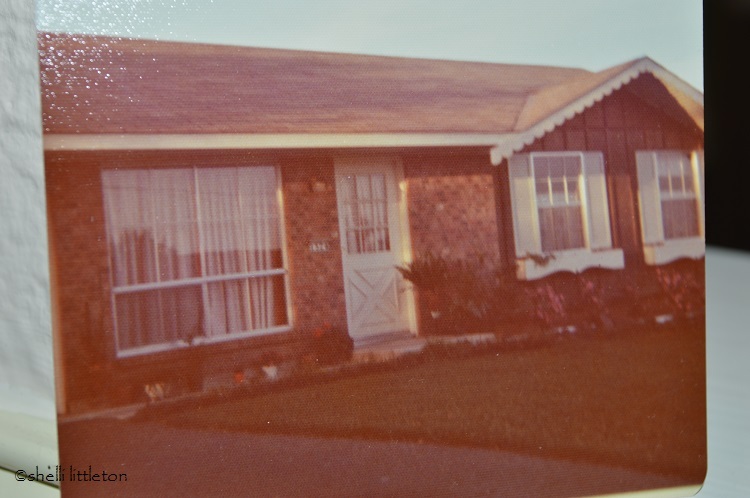 And when I see pictures of this beloved house … sadly, that is the memory that overtakes my mind. But do you see the window just to the right of the front door? That was my bedroom, and that is where I prayed with my mother to receive Jesus into my life. I was welcomed into my forever home, the body of Christ. And that is the memory I’m going to choose to overtake my mind. I do have a choice. I went back to that house when my oldest daughter was little, 16 years ago. O Soul, do you see yourself? What will you choose to see? But I’m going to choose to see the one who is blessed. The one blessed with life. The one blessed by adoption. The one given her mini-me of the heart. The one blessed with forgiveness. The one who doesn’t have to get it right. Father, Father … I love you. Have you had to choose to see the good over bad? Did good prevail? What a brave and wonderful post, Shelli. I get to make that choice in my life every day. I can seethe opportunity to help others in ways that are still open to me, or I can wallow in self-pity and demand that attention be paid ME and not THEM. And by the way…my second novel…unpublished thus far…is set in Tyler! Just to make things weirder, my most recent (and, yes, not yet published) “Emerald Isle” has a major scene set in Brodhead, Wisconsin…where Shirlee Abbott's brother had been Chief of Police. I can't believe your MS in set in Tyler! Wow! I spent my first 10-11 years there, and my dad still lives there. And he and I are close. Tyler is beautiful … for the roses, the azaleas … and the city is spread out nicely … not congested, as much. And yes … we have to put our hopes and dreams aside to love others and that's when we find ourselves healed … maybe not physically, but mentally and emotionally. And if anyone had a right to wallow in self-pity, it's you … and the fact that you don't, to my eyes, is what makes you all the more amazing and heroic. You are loved by so many, and I'm loving being an eye witness to where God is taking you and how He's using you. Your testimony is spreading out before my eyes daily … and that makes me smile. Yeah, you know you are loved. Thanks for this encouraging post, Shelli. How we choose to think is so important. We don't have to accept whatever gets dumped into our thought life. Satan's had a playground in my mind at different points in my life. The older I get, taking my thoughts captive is something, through the grace of God, that I've become better at. On a totally different silly note, the little mismatched outfit your wearing when standing by your friend reminds me of the time I wore red pants with birds on them (and I am afraid of birds) with a figured top with trees on it. I'd begged my to let me decide what to wear to school one day when I was in third grade. She let me. Didn't say a word to me about what I'd picked. Lucky for me, I don't remember hearing any snickers at school either. Shellie, heart twinges came when I read the part about your daddy leaving. That happened to my children, and my tears couldn't stop flowing for their pain and sorrow, and also for mine. Your sweet Momma shared Jesus with you, that, too, is a marker to the good, that speaks of hope and joy and eternal life. So glad for that. You have a voice that speaks truth, thank you for your words. Oh, Norma … you gave me goose bumps. Thank you for stopping by … taking the time to comment and let me know you see and hear me. That means the world. I read your blog … about your husband … I know you know. I always remind myself that God is in control, and He doesn't waste anything … if we are willing to be used.